Any homeowners in need of siding for an upgrade or new installation at their Placitas, New Mexico, home, should turn to the leading exterior remodeling experts – ABC Seamless of Albuquerque. We have proudly served the area since 1989 by offering exceptional products with even more impressive installations. Variety of colors and styles – Our cladding is available in either log, horizontal, or board and batten style with a large selection of colors to choose from. On-site fabrication – We create all of our cladding at your home to ensure that it stretches perfectly from side-to-side, eliminating seams and wrinkles for enhanced aesthetic appeal. 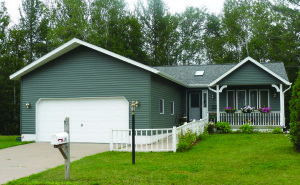 Low maintenance requirements – With a Kynar 500® finish you will never have to worry about painting your siding again. What’s more, our siding is made from 28-gauge, hot-dipped, G-90 galvanized steel, making it one of the strongest cladding materials in the industry. This allows it to stand up to the weather better than any other product on the market. To learn more about the steel siding products we install for residents of Placitas, NM, and the surrounding areas, contact ABC Seamless of Albuquerque. Make sure to ask about our financing options that we offer to all homeowners who qualify.